Spider-Man Far From Home Title Announced | Nerd Much? 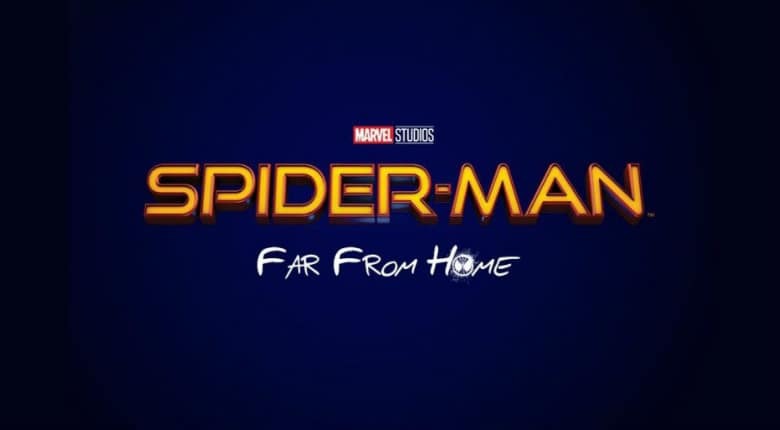 Spider-Man Far From Home logo. The days of calling the next Spider-Man movie Spider-Man Homecoming 2 are no more. We now have confirmation that the sequel to the character’s solo MCU debut will be titled Spider-Man Far From Home. The “leak” stems from an Instagram post published by Spider-Man/Peter Parker himself, Tom Holland. The actor was behind the scenes at the Ace Seattle Comic Con filming a video for his 10.2 million followers. He was apologizing for not having any news to spill regarding the upcoming Spider-Man sequel. For those that don’t know, Holland (and to a greater degree his Avengers co-star Mark Ruffalo) has a track record of letting confidential details slip during interviews and social media posts. He’s surely been schooled by Marvel thoroughly by now, but the studio decided to have some fun with Holland’s track record. Holland apologizes on Instagram that there are “no real revelations coming out about Spider-Man 2.” He continues with a smirk saying “I don’t know much about it…” and then drops a colossal Avengers: Infinity War spoiler for the two of you out there that haven’t seen it. But as he rambles on to his fans, he casually lifts an iPad in his non-filming hand. And it doesn’t take much effort to make out that on the screen is the title for his upcoming sequel, Spider-Man Far From Home. Alongside the title, we’re starting to piece together bits and pieces on the upcoming project. As the title implies, Parker is expected to globetrot a bit in 2019’s continuation of his story. Actually, it will be the first Spider-Man film to take place primarily at a location outside of New York. We also have a rough idea of what villains to expect. Michael Keaton will return as Adrian Toomes/Vulture. And Jake Gyllenhaal has reportedly signed on to serve as the first feature film incarnation of the classic Spider-Man villain, Mysterio. We’ve also seen Shocker and we’ve met Mac Gargan in Homecoming. Could the Sinister Six be forming before our eyes? We really don’t have too long to wait for more details begin to trickle out. Spider-Man Far From Home starts filming next month and will release in theaters on July 5th, 2019.